Hindsight really is 20-20... and worth much more than twenty dollars. When I look back on my adolescence, I'm amazed by the degree to which consumerism played a role in popularity. Whether it was carrying your books in Esprit bags or wearing Girbaud jeans, the cliques in my school all reinforced the messages that brands paid millions to deliver. Namely, if you wanted to be happier, cooler, thinner, prettier or healthier, you would buy whatever it is they were selling so you could be accepted or be loved... at least until the next product came along. The only difference was that unlike the international companies that shelled out money to PR firms and commercial directors, the kids in suburbia weren't being paid to peddle goods. Well, what if you were? In commercial director turned debut feature filmmaker, scripter/helmer Derrick Borte comes up with an ingenious premise as he introduces audiences to a surface level picture perfect upper middle class family – the kind everyone would want to emulate because they're living the American dream, or at least that's what they want everyone to think. And because we're currently living in a society where everyone is shuffling around credit cards to “keep up with the Joneses” as the old adage goes, Borte aptly applies the same surname to the smiling family of four, who aren't exactly a family as in related by blood but rather part of the same corporate family. Paid to become the “pack leaders” of their community by taking the up-and-coming concept of stealth marketing to a whole new level, the Joneses start new trends as soon as their feet touch the pavement on moving day from innocently posing for a video for grandma to pitch the gadget to passersby to offering a certain brand of beer to those stopping into welcome them. Others quickly buy all of their fabulous accessories ironically to assimilate with the Joneses rather than following the trend of most transplanted families who struggle to fit in with their new surroundings. 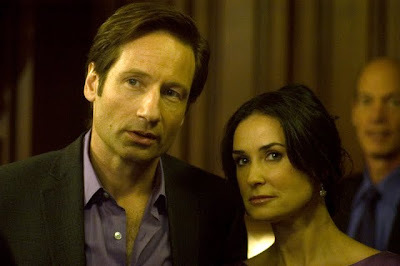 While to the outside world, Kate (Demi Moore) and Steve (David Duchovny) appear to be the blissfully happy and proud parents of teens Mick (Ben Hollingsworth) and Jenn (Amber Heard), in reality the four successful salespeople are virtual strangers taking Kate's lead as their boss in order to skyrocket sales in time for their next corporate review. Yet even though this is Kate's sixth consecutive year as a different Mrs. Jones, whom we gather has probably worked with Mick and Jenn before, it's former Scottsdale, Arizona car salesman Steve's debut as an undercover marketer. And despite the fact that he pumps up the others with the vow to “do some damage in this town,” Steve struggles with coming on a little too strong via fake compliments and sales pitches, striving to develop the killer instinct that company head Lauren Hutton tells him can land him anything, perhaps even the object he's most longing to acquire in the form of Kate. Although Borte may have shown his hand a little early by revealing the truth about the Joneses, the development of their two friendly but economically struggling neighbors played by Glenne Headly and Gary Cole manages to add a nice balance to the work. Unfortunately I'd hoped that Borte would've offered us a little more background on the real lives of the Joneses to ensure that we were more emotionally invested in the individuals to best appreciate the third act twist and unraveling of their facade. Without more to share with us, the otherwise fascinating and intelligently entertaining film transferred to technically flawless Blu-ray fails to deliver fully on its darkly satirical Truman Show style premise. Yet even its flaws can't detract from the quality of the work and the surefire fuel for post-film discussion given the concept. Ultimately augmented by terrific characterizations from its charismatic leads, The Joneses marks an incredibly promising debut for the filmmaker, considering the timely work that eerily enough does have some roots in reality as average Americans are paid to chat about products or push a brand under the guise of being their friendly, popular selves.